Another excellent stay at SAVA villas. Perfect for families with small children, grandparents, teens. Hospitality was beyond exceptional this time with JIAP our manageress who did all she can to accommodate our requests. Our live-in maid was attentive, obliging and always polite. Our meals were always good, prompt, satisfying. Although it is a bit further away from Phuket Town, more than 1 hour, but there was enough to keep us happy and entertained on the premises and our slice of beach in front of our property. This August brought lots of awesome waves for boogie boarding, but too rough for an actual swim. There brought lots of debris from the nearby towns, but our household staff made sure it was all clean by the time we went out again. It also depends on which way the wind blows, carrying along with it everything in its way. This is our second trip, and definitely not our last. We have stayed in many luxury properties across the globe, but this one tops them all! From the beautiful setting, to the supreme accommodations, we were truly blown away. The food west the best Thai food we have ever had, cooked by the wonderful chef, and the staff, in general, bent over backwards to make our experience better than we would have imagined. The beach, which is right at your fingertips, is almost completely secluded and the whole complex is very quiet. We have never been so relaxed on a vacation. 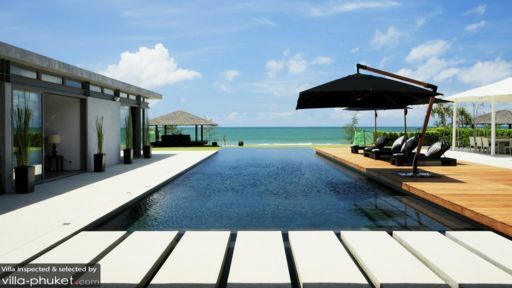 Close enough to the hustle and bustle of Phuket, if needed, but we didn't leave the villa, because it was so fantastic! We will definitely come back and stay for longer. You don't want to miss this experience. This Sava villa was perfect for the two large families staying. We also though it would be the perfect place to come back to with 4 - 6 couples only. Incredible value, the same villa in Hawaii or the Caribbean would be at least 5 times as much. Staff were amazing, and the food choices and quality were so good that we never wanted to eat out for any of the meals during the entire 10 days. The whole property was perfectly laid out for maximum pleasure and relaxation. Even though it was high season over Christmas, it felt like we had a 5 km stretch of pristine beach all to ourselves. With lots of children there was no shortage of pool and beach volleyball, a great grass area for soccer and a great TV room for them to chill out in and play games. Perfect, perfect perfect. A group of 12 people picked this villa for our 5D4N trip. When we viewed the photos online, we were already very excited but as many of other hotel sites, photos can be very deceiving! 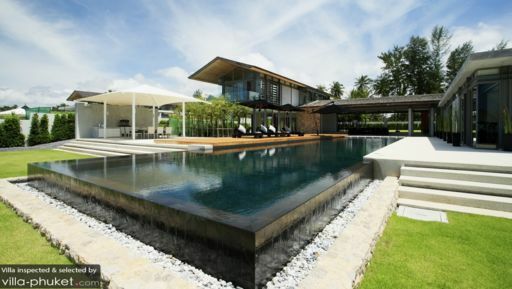 Villa is not close to the centre of Phuket ie. Patong which is about one hour drive. It doesn't matter as it's not our main focus. We had mini-van pick-up service from Phuket airport to villa which took about 30min drive, when arriving the villa, we immediately shouted out loud, it's exactly what we have seen from the website, even more spacious as expected. 2 huge living rooms, 6 rooms (3 facing the pool, 3 upstairs), open bar/dining area and a kitchen at the back, a huge 25m pool, and a huge football field at the back with a trampoline. 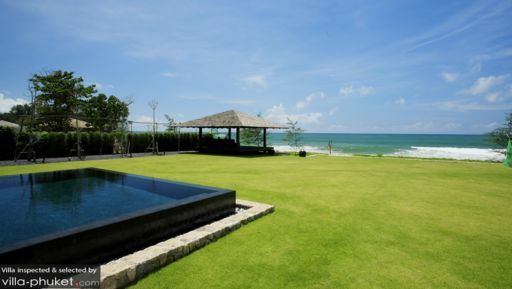 The villa is connected to the beach at the back, facing Indian Ocean. We got 4 butlers serving us from 8am to 9pm, and one staying over night but only available in case of emergency. Cost per night was about USD1,500 - for 12 of us, it cost just USD120 per head per night... We basically spent 80% of our time in the villa during our stay. They provided basic food for breakfast but on the first day, the driver drove us to Big C, the biggest supermarket in town, to get food to cook, drinks, and snacks. We just told the butlers what kind of food we wanted to eat, and they would come up with 5-star hotel standard meals, eg. they cooked lobsters which just been caught from sea, home made the sauce for main dishes, and made us fresh fruit slurpies, etc... Seriously, no negative comments I can put here.. I highly recommend this villa to everyone and I am sure they would comment the same as I just did. We used Sava Villa #4 for our wedding ceremony - and also to house the immediate family coming for the wedding. It is a venue that is just beautiful on it's own, but also with really amazing potential if you're able to go the extra mile. We held the ceremony on a platform over the pool, the reception on the grass lawn, and the party on a dancefloor initially, before everyone ended up in the pool. It was one of the best times we've ever had. As a general holiday house as well its fantastic. Peaceful, huge, decked out with everything you need. There's also in-house cooks who cook for you on demand (with a bit of notice). For weddings of large groups, one consideration is that its quite far from everything else like The Laguna area, but for us it was totally worth it. We looked at over 25 different venues, and this was #1 by far. From the moment we walked through the front door we knew this place was very special. The house is stunning as well as the views and the beach not to mention the gardens surrounding the house. The food was the best I have ever had worldwide - so many amazing dishes. The staff were polite, friendly and incredibly professional. This was an memorable trip that we would go back too again for sure.